Over the past several years, a significant debate has arisen over the future of energy in the U.S. Advocates and industries from all sides have been clamoring to fit their piece into the new-energy pie, where renewables such as solar and wind contend with concepts such a “clean coal” and nuclear (which has recently come under significant scrutiny in the face of Japan’s current nuclear crisis). Another energy source that has received a good deal of attention in recent years is that of natural gas, with President Obama himself identifying natural gas as an important component in America’s energy future. Yet recently, a major push-back against natural gas has begun to occur. The focus isn’t so much on the gas itself, but the technology used to obtain it. High-volume horizontal hydraulic fracturing, or “hydrofracking” as it has been termed, is a fairly new technology that has enabled energy companies to extract gas that currently exists buried underground in shale rock. Supporters of the practice claim that hydraulic fracturing is a perfectly safe technology that will move the U.S. towards energy independence and a greener future. However, this past February the New York Times published an article that refutes these safety claims. It cites unreleased EPA reports that suggest the chemicals used in hydrofracking are contaminating ground water and waterways in areas where the drilling is taking place, as well as areas where the wastewater is being shipped for treatment. A 2010 documentary entitled Gasland yielded similar results. After being approached by an energy company about signing a lease to extract natural gas from his land, filmmaker Josh Fox explored the process of hydrofracking. This project lead him to find and document the profoundly negative impact hydrofracking has had on communities across North America. What, you might ask does this have to do with the usual food and farming topics I usually cover in my blog entries? 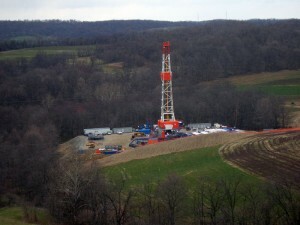 Much of the drilling is taking place on and around agricultural land. 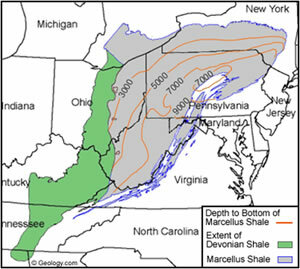 The Marcellus Shale, the area in New York and surrounding states that is being targeted for drilling, is also an important agricultural area in the New York foodshed. Among the many concerns that anti-fracking advocates have is that the drilling will contaminate the land and water in these areas, making it unfit for agricultural production and destroying the livelihood of regional farmers. The debate over hydrofracking is heating up, as New York State’s temporary moratorium on permits is set to expire in July. Public officials and anti-fracking activists are hosting a series of events over the next few months to call attention to the issue. On May 5th Manhattan Borough President Scott Stringer, State Senator Liz Krueger, Assemblymember Brian Kavanagh, Councilmember Rosie Mendez, and Baruch Grassroots are co-hosting a free screening of Gasland, followed by a Q&A with filmmaker Josh Fox. On May 16th, the Baum Forum, in conjunction with Parsons The New School for Design, will be hosting Water Fight! Fracking, Food, Art & Economy. This half-day conference will include speakers from a range of disciplines discussing the adverse environmental and economic impacts that gas drilling in New York State would have on the region. Full event details for both events are below.